On Wednesday, right-wing investigative journalist Laura Loomer was permanently suspended from social media platform Twitter over a tweet wherein Loomer criticized Rep.-elect Ilhan Omar (D-MN) and Islamic practices like female genital mutilation (FGM). "Isn't it ironic how the twitter moment used to celebrate 'women, LGBTQ, and minorities' is a picture of Ilhan Omar? Ilhan is pro-Sharia Ilhan is pro FGM. Under Sharia homosexuals are oppressed and killed. Women are abused and forced to wear the hijab. Ilhan is anti-Jewish," said Loomer, 25. The tweet apparently violated Twitter's "rules against hateful conduct," which seem to be applied fast and loose and mostly dependent on your political ideology. Loomer, who is Jewish, had accumulated over 260,000 on Twitter before she was effectively silenced. It took Facebook less than 24 hours to issue a suspension against Loomer. In a statement on social media platform Gab, which describes itself as "the free speech network," Loomer said she has been "silenced in America for simply telling the truth." "Free speech is under attack by the Left and big tech companies in this country," said Loomer, adding, "My haters are celebrating today, and they are saying this is the end of my career, but I want everyone to know I'm just getting started. Everyone who knows me knows I don't back down." Rep. Omar, who is Muslim, has a history of anti-Israel comments, and voted against a bill that would block efforts to boycott Israeli businesses. "Israel has hypnotized the world, may Allah awaken the people and help them see the evil doings of Israel," said Omar in a tweet from 2012, which she defended as recently as May 2018. Additionally, as reported by The Daily Wire, "In 2017, the Minnesota House passed HF400, the 'Israel Boycott Ban' bill, which banned the state of Minnesota, including Minnesota colleges and universities, from contracting with vendors boycotting Israel. Omar voted against the bill, saying, 'I would have loved to vote for a bill that expands our ideals of fighting against discrimination, that actually stood up against all discrimination. I don’t want to be part of a vote that limits the ability of people to fight towards justice and peace.'" 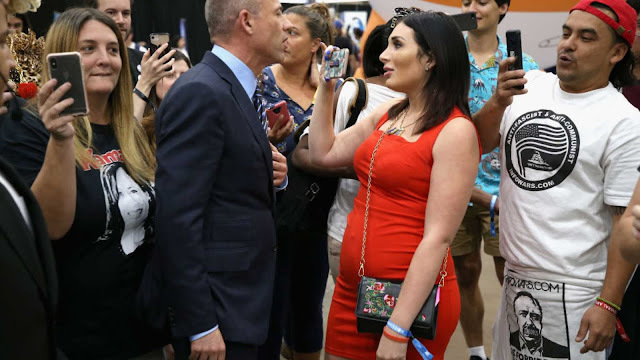 Loomer recently made headlines for confronting celebrity attorney and anti-Trump activist Michael Avenatti and Women's March supporter and actress Alyssa Milano at Politicon in Los Angeles. After Loomer confronted Milano about the Women's March's leaders' ties to anti-Semitism, the actress denounced them. On Wednesday, in a video reacting to the Twiiter ban (see below), Loomer called on President Donald Trump to do something about the "monopolistic" big tech companies silencing opposition. "If you want to win in 2020, you have to ensure your supporters have a voice on social media," she implored. Here are a few of the reasons why most grown-ups know the so-called “Holocaust” is an outrageous hoax, a colossal fraud and a malicious libel that defames the memory of those who really did die. We’ll examine some of these facts in detail below. More people died on the back seat of Ted Kennedy’s car at Chappaquiddick than in any “gas chambers” throughout WWII. (1) Insufficient time to cremate more than 400,000 bodies at Auschwitz-Birkenau, when Hoaxers claim more than a million were murdered there (after abandoning their claim of “four million” in the 1990s!). (2) Insufficient fuel to cremate more than 100,000 bodies at Auschwitz-Birkenau, when Hoaxers allege more than a million were murdered there. (3) Insufficient firebrick durability to cremate more than 108,000 bodies at Auschwitz-Birkenau, when Hoaxers contend more than a million were murdered there.